To a serious horse owner there is no investment more worthwhile then your horse itself. Whether that means training, medications, or nutritional needs, we know that there isn’t anything you wouldn’t do to ensure your animal is in peek condition. Here at Mansfield we pride ourselves in stocking our shelves with the top products you need for your horse’s nutritional demands. 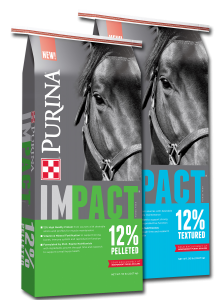 Purina Impact is the newest addition to our shelves and is formulated to address the nutritional demands associated with the equine aging process. This complete feed has adequate roughage built in to help address some of the issues older horses have with chewing or digesting forage. Have any questions about Purina Impact? Give us a call at 817.473.1137 or run on down to the store and give us a visit!